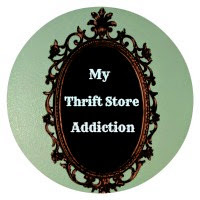 Cecilia Lynne of My Thrift Store Addiction recently contacted me about joining in on a blog tour. She has an Etsy shop and shares pretty, thrifty things. Basically for a blog tour I answer a few questions about myself, and then introduce you to a few blogger friends to learn about them. I like to read about how other people work through the creative process. I like to share, so I’ll just tuck my social awkwardness back up and give it a go. When you’re done don’t forget to visit my little friends and sprinkle some love on them. Freakin’ everything. I’m so bad at starting a lot of different projects, hitting some supply or info I don’t have, and putting it on the back burner. Right now I have drafts for a frugal party plan and a daily routine for littles going. Also for my shop I have a line of weekly planner boards to design, make, glitter, photograph, and post. In “real life” kid #3 is starting kindergarten and Mom is TWEAKING OUT. This Mom is not ready. My little extrovert is totally ready. Not so, Mom. Because for fun. No, wait… I think there’s currently a gap in women’s (and men’s) education. Moms are working full time, or not even present, and don’t teach us how to make a house a home. People don’t know how to cook, or clean, or balance a checkbook, or fold a dang fitted sheet. I wish I had a mother or a grandma to ask about things. But I don’t. So I’m going to be the internet’s grandma (yes, in my 30s). I like to help people. I spend a lot of time trying to figure out how to do things with a minimum output of resources (picture empty wallet here). I can share that knowledge and hopefully help someone else. My shop is an extension of my love for sharing. I’ve always liked crafting, making things sparkly (I’m part raccoon), and working with graphics to make pretties. And I totally love giving people presents. I feel like every item I make is a present for someone, and I put the love in there. This is my way, like so many others, to make a little money doing something that I enjoy. I am so pleased to be able to search on Etsy and find something beautiful that some other mom, maybe even a neighbor, put sweat, tears, and glitter into. This is something I’ve been working on. That whole process thing. It’s not supposed to be me brandishing posts when they strike me, this is what I have heard. I’m always considering things I could write about. But often these ideas go on my mile-long idea list and never make it further than that. Life usually prompts the topics I am posting about. If I have a birthday party and I do a bunch of research to do it without spending too much money, I then organize that information and make an article with it. I always make a monthly real food meal plan, so I share that. Currently I’m working on an editorial calendar, so I can have posts ready when holidays and things roll around. Except my meticulous mind has to do it RIGHT and COMPLETELY so it will take me forever. And then be awesome. My items are created in a similar way. Except finding money for supplies to make a prototype is hard with no disposable income, so I have the added challenge of creating items with little initial output. This is not a bad thing, it just means I have STACKS of cereal boxes and egg cartons towering over me. Luckily, glitter is pretty cheap. 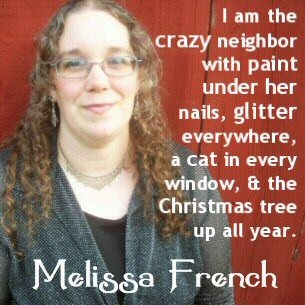 Melissa French lives in New Hampshire with her family of six. She is the offbeat neighbor with paint under her nails, a cat in every window, and the Xmas tree up all year. Her blog The More With Less Mom, born in 2010, is designed to help the frugal family stretch dollars and enjoy life. Her shop HousePunkery is full of neat schtuff for your favorite geeks, freaks, and glitter lovers. Her quirky, painstaking posts are the delight of the internet and social media users who follow her. Her glitter addiction is surpassed only by her love of chocolate. And possibly her kids. Show my little friends some love! In one week these peeps will be posting their own tour and introducing their little friends, so come back and visit! Lydia from Five4FiveMeals.com lives in South Alabama with her husband and two toddlers. She has always loved telling stories. She started her career as a newspaper reporter. After five years she traded in her reporters notebook and black wedges for bare feet and diaper changes. She started blogging in 2012 and still tells stories, but this time her own story of surviving motherhood in the country. She and her husband recently paid off their debt and she talks openly about that along with making videos about cooking, the hilarity of motherhood and surviving the baby years. She recently gave up sugar… and already regrets it. Lara French is a typical freak (irony intentional, sarcasm offered for free), living in New Hampshire. She shares much weirdness and frolics in the hyperwebs. She posts anime parodies, fanfiction, song covers, cosplay stuff, and more. Geekery and derping. You have been warned.